Is Silicon set to Change the GaAs Mindset for VGA Applications? Rapid advances in device technology can lead to established design best practices being called into question. 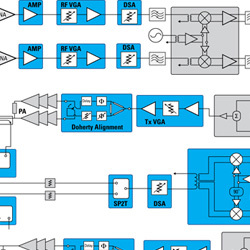 Until recently, engineers designing RF and microwave circuitry for applications such as 4G base stations, broadband repeaters or distributed antenna systems would automatically choose GaAs FETs to achieve the best noise figure and linearity. Silicon-based devices would rarely be considered. Now, however, silicon can allow a superior solution as issues such as size, cost, reliability and settling time become increasingly important, and as technological improvements enhance critical aspects such as noise, distortion and transient response (figure 1). GaAs technology has been a key enabler of the wireless revolution, offering alow noise figure and high linearity beyond the capabilities of contemporary silicon devices. Since the noise figure and linearity are major factors that determine the overall distortion introduced in the system by key functions such as variable-gain amplifiers, digital step attenuators, switches, mixers and modulators, GaAs devices are often chosen by default where best signalling performance is required. As a more specialised technology than conventional silicon-based fabrication, GaAs is relatively limited in its application to pure analogue functions. Inclusion of digital circuitry usually entails designing a multi-die module on a laminate substrate. This is expensive and results in degraded moisture sensitivity thereby requiring special storage and handling. GaAs based modules typically have an MSL3 sensitivity rating, and so must be used within one week after sealing to guarantee moisture absorption will not damage the device leading to early failure. Silicon-based ICs, however, are typically implemented monolithically in a QFN and thus have a lower-sensitivity MSL1 rating, and can be shipped on standard reels and require no special handling processes. Silicon devices in QFN packages also benefit from much lower thermal resistance when compared to GaAs based laminate modules, which aids reliability and can help simplify thermal management and heat sinking requirements. In addition, GaAs devices have relatively low ESD – they typically withstand a Human-Body-Model (HBM) threshold of only 500V. This contrasts with 2kV for comparable silicon parts. As a result, GaAs devices can be easily damaged by low-level ESD events that may happen in a typical assembly area. A similar silicon device requires much less stringent anti-static precautions. Silicon-On-Insulator (SOI) switches also typically have a superior RON x COFF figure of merit, and hence exhibit lower insertion loss while also allowing greater isolation. Finally, circuits containing GaAs devices tend to be more reliant on on external passives such as inductor and resistor components which take up additional space and add to the solution complexity. Infrastructure equipment for high data-rate 3G and 4G communications systems, as well as other industrial systems, require RF transistors to settle quickly after switching so as to meet time-critical performance or maintain signal integrity. The settling time is affected by the gate lag associated with the switch. The gate lag experienced in a switch when turning on can be considered as the difference in the switch resistance between the point that the 10-90% rise time is completed and the point when the switch can be considered fully stable; typically this is between 97.5% and 100% turned on. Gate lag can also be viewed as the time difference between when the RF power out of the device is at 90% amplitude and when fully settled to 100% amplitude. GaAs devices are known to have appreciable gate lag, particularly when operating in low ambient temperatures, which can restrict system performance. A high-speed communications system must wait for this settling time before beginning transmission. A long settling time may restrict the speed and agility of the system, and can also lengthen test duration in a production scenario. 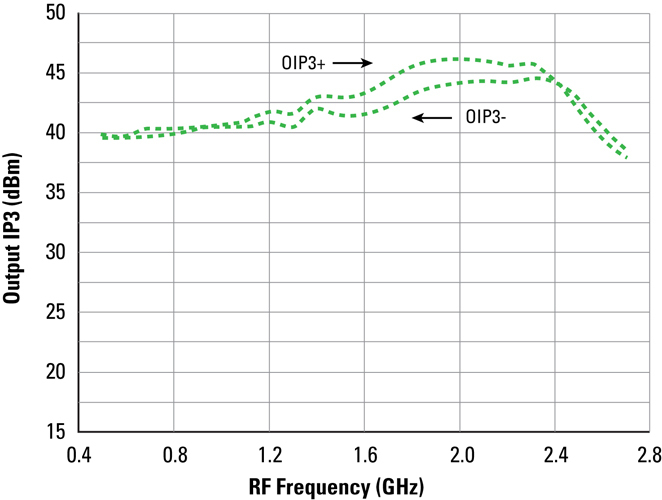 Despite the known drawbacks of GaAs, superior noise figure and Third-Order-Intercept (IP3) linearity compared to silicon have usually outweighed these disadvantages. Now, however, with the benefit of new technologies that help overcome traditional limitations, silicon devices can present a stronger alternative offering the chance of a more economical and reliable solution. The new generation of RF switches using SOI technology such as IDT’s F2912 can operate reliably in the very high temperature environments found on or near the PA assembly. These new silicon switches offer superb performance (0.4 dB Insertion Loss, +65 dBm IP3, 60 dB Isolation) at temperatures up to +120°C (figure 2a). Figure 2a. High Rel SOI Switch Performance (F2912). 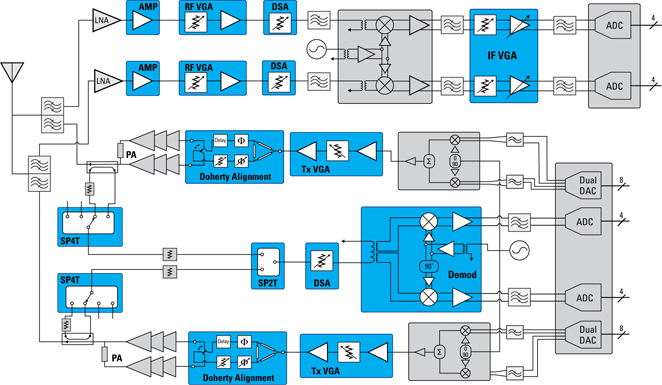 The new generation of silicon IF Variable-Gain Amplifiers (VGAs) such as the IDTF1240 has delivered a breakthrough improvement in SNR by incorporating FlatNoise technology. 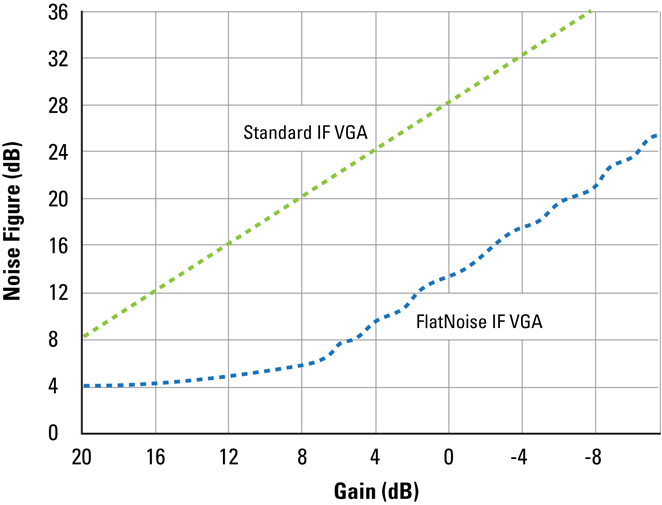 FlatNoise ensuresthat the noise figure stayslow even as gain is reduced (figure 2b), in contrast to the past where engineers have had to accept a 1dB deterioration in noise figure with every 1dB reduction in gain. As a result, the system SNR can be improved by up to 2 dB while still maintaining very high linearity. Figure 2b. Effect of FlatNoise technology on IF VGA noise figure (F1240). Linearity is another important parameter that has recently been significantly improved in silicon devices. IDT’s F0480 silicon-based RF VGA with new Zero-Distortion technology is able to achieve > 40dBm OIP3 with 2000MHz of BW and 23dB of adjustment range at only 100mA quiescent current (figure 2c). Generally, improving linearity and Bandwidth at the VGA gives designers greater flexibility to implement the receive system. Figure 2c. New Broadband Silicon RF VGA with Zero-Distortiontechnology (F0480). IDT has also overcome an important weakness that affects Digital Step Attenuators (DSAs),by developing Glitch-Free technology. 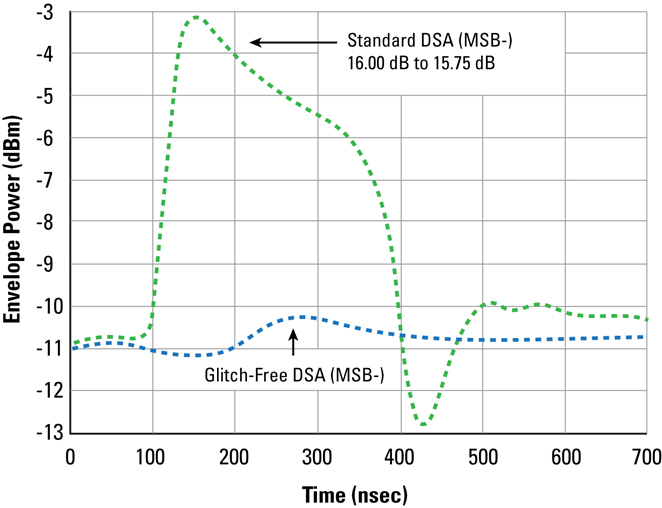 Glitch-Free reduces the known transient overshoot that occurs during MSB state transitions from 10dB to only 0.5dB (figure 2d). In precision level setting environments like transmitters, this technology ensures that gain can transition smoothly to adjacent settings. Historically, the large 10dB glitch has been capable of damaging the downstream power amplifier. Furthermore, traditional DSAs take a long time to settle, which degrades the turnaround performance of a Time-Domain Duplex (TDD) system. By nearly eliminating this overshoot, Glitch-Free significantly improves system reliability, and allows for more agile TDD systems. Figure 2d. Glitch-Free SOI DSA (F1950). 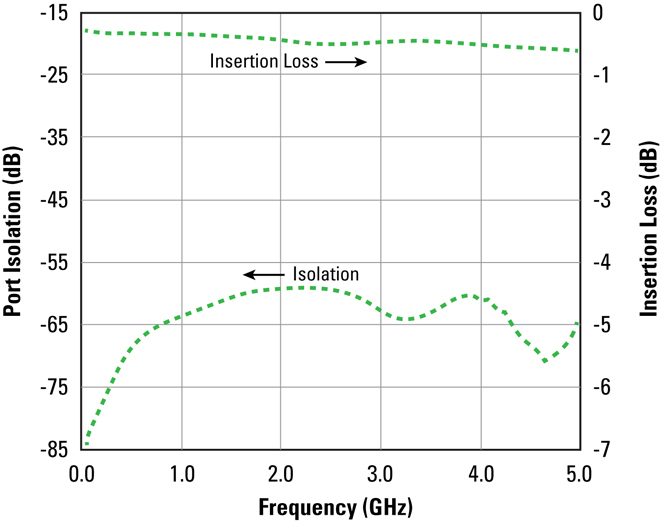 The high linearity and favourable noise characteristics that characterise GaAs amplifiers and switches have made this technology the default choice for designers of high-performance RF equipment. Superior performance in these respects in the past has secured the position of GaAs, despite the superiority of silicon-based devices in terms of reliability, integration and cost. Recently, these factors have become more important, driving renewed interest in using silicon-based devices. With improvements in noise performance and linearity, thanks to new technologies such as SOI, Zero-Distortion, Glitch-Free, and others, this technology now presents an attractive alternative to GaAs. Chris Stephens is the General Manager of IDT’s RF Division; he was one of the 4 original members of this division when it was cold-started in 2009. Prior to joining IDT six years ago, Chris had a 20-year career marketing integrated transceivers, pioneering Polar PA technology, and developing portable radios at Maxim, TriQuint, and Motorola respectively. Chris has been awarded a US Patent and holds a Bachelor of Science Degree in Electrical Engineering from Virginia Tech.